Few spring and summer dates left. 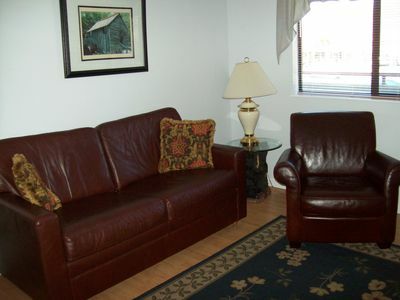 APRIL SPECIAL - all open dates $199/nt plus tax, cleaning and VRBO service fee. June 1 - 8 open, hurry before it's gone! New carpet and tile, refinished hardwood floors! Why settle for less when you can have Simply The Best! 3 to 7 night minimum stay (unless only 2 nights available). LOCATION, LOCATION, LOCATION ! - It may be an overused cliche but it's true. 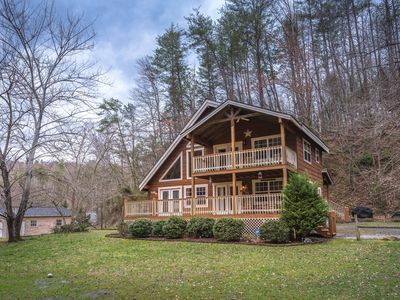 There is no better location in Gatlinburg - close to everything yet serene. 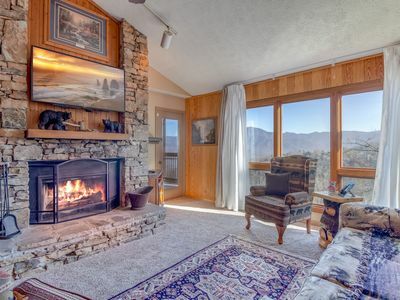 An exceptional retreat in the heart of the mountains. 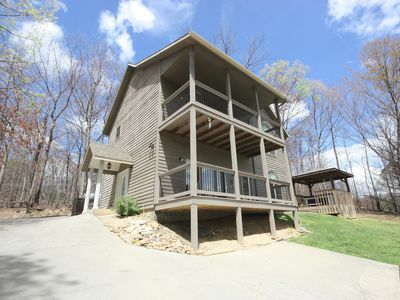 It's true, there are lots of cabins to choose from, but why not choose THE BEST! You deserve it! 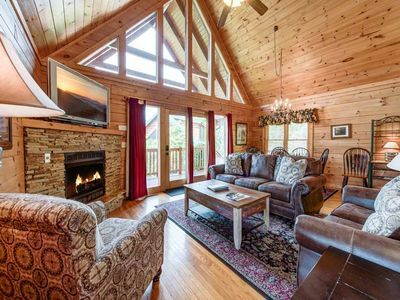 High Mountain Lodge is the perfect spot to celebrate family, good friends, and life. 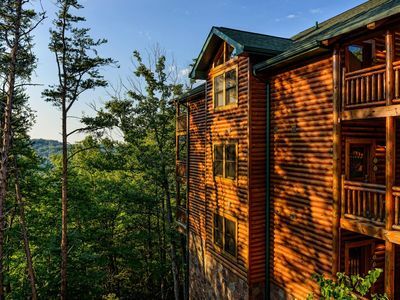 Enjoy spectacular views of the Smoky Mountains National Park, Clingmans Dome and Mount LeConte from one of two huge covered decks. 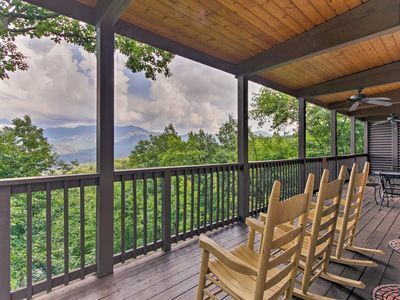 Rock away the stresses of every day life in one of our rocking chairs while enjoying pure mountain air. Watch over those perfect steaks on the grill from the stone cocktail patio. Don't think the views end when the sun sets. 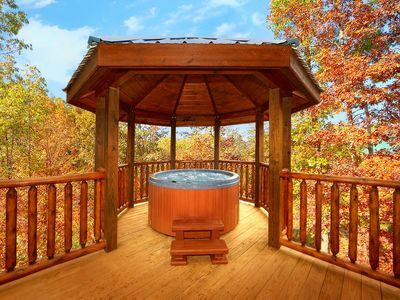 Just picture yourself gazing at the twinkling lights of Ski Mountain and downtown Gatlinburg from the PRIVATE HOT TUB - ah romance! If you think the outside sounds great just wait till you walk through the front door! You're sure to enjoy the impeccable attention to detail throughout the cabin. 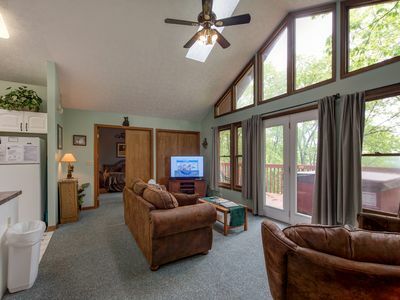 This professionally decorated cabin features high end furnishings, and hand crafted furniture. 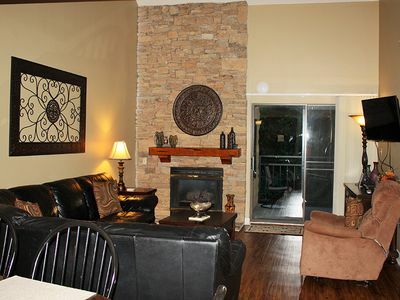 What could be better than basking in the warmth of the stacked stone gas fireplace (all the ambiance without the mess). If you're in the mood for a good movie just put your favorite in the Blu-Ray player and watch it come to life on the 60' flat screen TV. The handcrafted dining table is the perfect place to enjoy family meals under the warm glow of the antler chandelier. 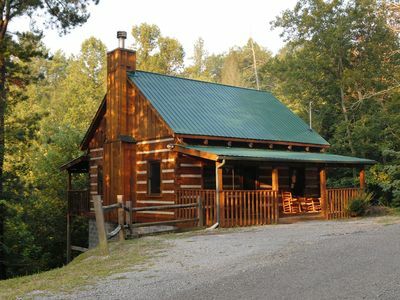 High Mountain Lodge offers numerous unique touches found in no other cabin. If you need to stay connected our free wireless internet is available throughout the cabin. The handcrafted desk in the living room is perfect for your laptop. The gourmet kitchen provides ample space to prepare anything from holiday dinners to simple snacks for the kids. This larger kitchen has more cabinet and counter space than most of the other cabins in the area making it easier for the chefs in the family to perform their magic! The fully equipped kitchen includes stainless steel appliances, granite counter tops, stamped tin back-splash, Pfaltzgraff dinnerware, Wolfgang Puck cookware, and even a coffee grinder and waffle maker. This kitchen will make you want to cook! 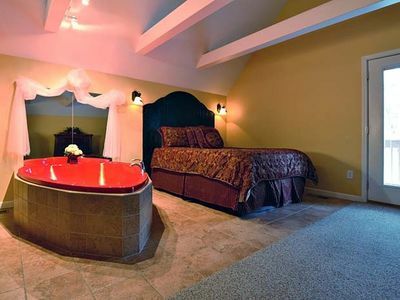 The three master suites, with attached baths, are situated on separate floors to ensure privacy. All master suites are private - NO OPEN LOFTS. Snuggle into luxurious bed linens on the king size beds. You won't believe how thick and fluffy our towels are. Each bedroom features 32' HD TVs with DVD players. The terrace level Texas game room is perfect for family fun and entertainment. 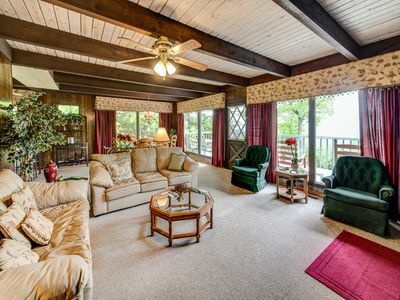 It is equipped with a 42' and 46' HD TV, BluRay disc player, stereo, pool table, Texas shuffle board, library for mystery lovers, day bed with trundle, and adjacent laundry. 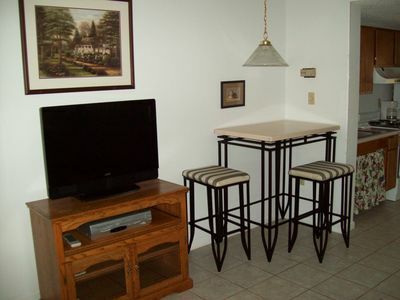 There is even a refrigerator to keep your drinks cold and handy. When you want to take a break from all the fun in the game room just step out onto the terrace deck which seats 6. This is the perfect place to sit on the swing and enjoy a good book. 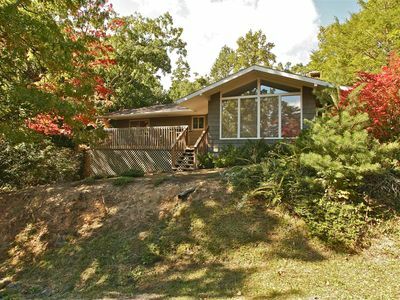 For those of you who love electronics, High Mountain Lodge will not disappoint! All 6 TVs have the following channels - HBO, Showtime, AMC, SEC Network, FS 1, NBS Sports Network, TLC, Travel Channel, HGTV, Disney Channel, Nickelodeon, Cartoon Network, Comedy Central, Discovery Channel, and many more! If you're planning a small wedding, family reunion, or a corporate retreat our clubhouse can be rented for a nominal fee. The clubhouse, which is adjacent to the pool, features a large meeting room with a beautiful stacked stone fireplace. There is also plenty of parking available. 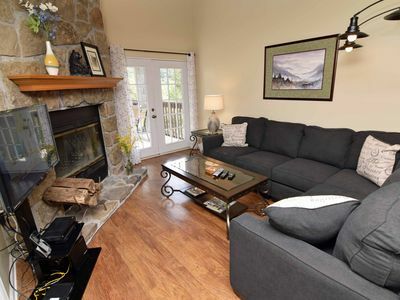 High Mountain Lodge is located close to a trolley station with lots of parking. Park your car and and for a nominal fee ride the trolley into town. No need to drive in and try to find parking. 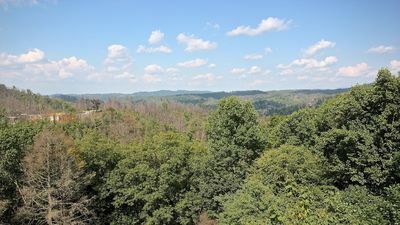 We are also conveniently located near the only grocery store in Gatlinburg. 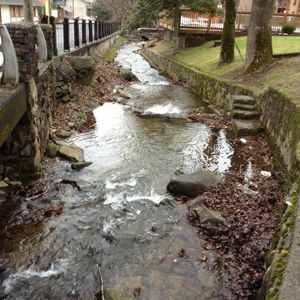 We are within minutes of several restaurants where the food is great without the long waits in downtown Gatlinburg. 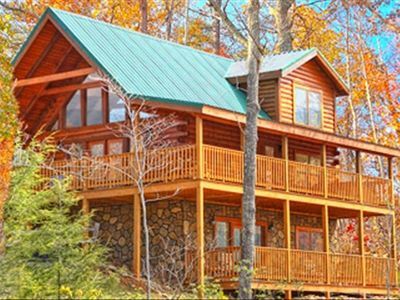 Gatlinburg Winter Magic - November, December, January and February. The City of Gatlinburg magically lights up the winter nights with millions of spectacular lights and lighted displays from November thru February. Fantasy Of Lights Christmas Parade - December 1, 2017. The City of Gatlinburg invites you to bundle up and generate a spirited dose of holiday cheer and soak up Gatlinburg’s 42th annual Fantasy of Lights Christmas Parade at 7:30 P M.
Westgate Smoky Mtn. 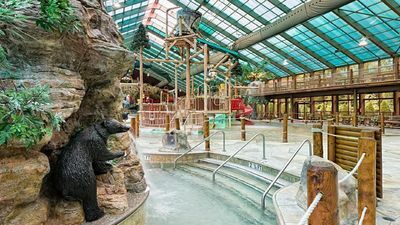 4/15/18-4/22/18 * 4 WATERPARK TICKETS INCLUDED! 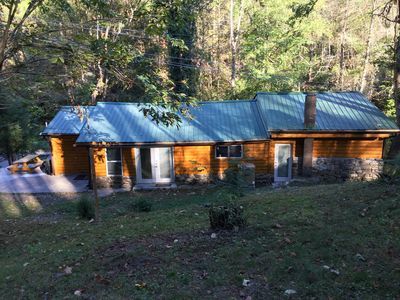 New Years Week Vacation 2018-2019 Mountain getaway!